Through your purchases, GAC helps provide much needed books to children in low-income communities, where early childhood literacy rates are at a disadvantage. We recognized early on that this gap existed with childhood literacy between low-income communities and with middle-income communities across the nation. Guardian Angel Council recognized there was a need to provide assistance to guide the future of not only our children, but for the impact that each of them will have with contributing to society as a collective generation. This is why we established in 2012 our Book for Book program where we help to erase the wide gap of early childhood literacy rates across the nation. There is only 1 book for every 300 children in low-income neighborhoods versus more than a dozen books per child in middle-income neighborhoods. The link between academic failure and delinquency, violence, and crime is welded to reading failure. GAC’s Book for Book Program is making a difference in educating the community with literacy and early childhood education. We partner with local businesses and organizations to provide books for children in need. This is why we provide bilingual books so that we can take this opportunity to educate the parents and caregivers of these children that it is imperative that they focus a portion of their time reading to their children. We have currently partnered with the Young Series bilingual chlidren’s books. 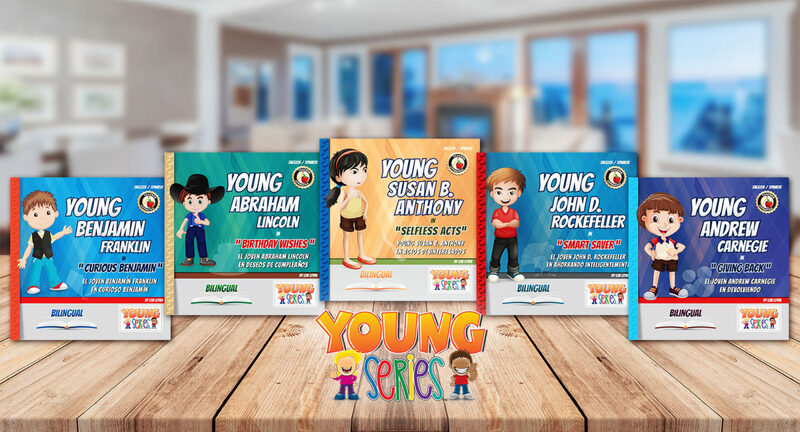 You can view the available books by visiting Young Series website. With your purchase, you are helping to increase the literacy levels across the nation. Guardian Angel Council is looking for partners to expand our Book for Book program. If you would like to learn more, please contact us today!